Merry beginning of the week to ya all! 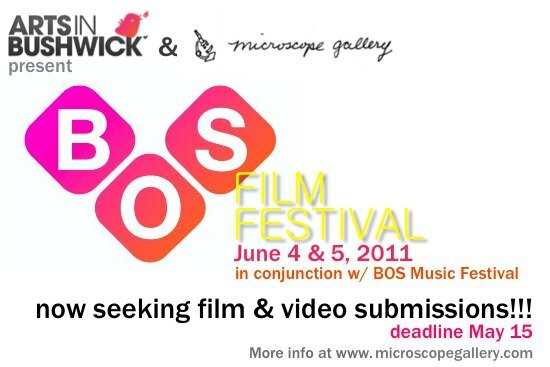 Hopefully, you managed to register your studio for Bushwick Open Studios 2011 yesterday and if you’re a film or video maker we have another deadline for you!! Mark May 15th in your calendars because Microscope Gallery in Bushwick, a gallery dedicated to film, video, sound, performance and other time-based art is now accepting film & video submissions of all types and formats for programs featuring innovative and unusual works by the Bushwick area artists in conjunction with the Bushwick Open Studios 2011 Music Festival. Your works should be under 30 minutes and completed in 2010 or 2011. The Festival will take place June 4 & 5 at Goodbye Blue Monday. Selected works will be announced on May 25th. If your work is not available online, send a preview DVD to: Microscope Gallery (Attention: BOS Submissions) 4 Charles Place, Brooklyn, NY 11221.